The Hats or "Bonnets" worn with the Kilt include the Glengarry, Balmoral, or perhaps a Flat Cap. Military Styles might include the Feather Bonnet or military style Beret which resembles a Tam. 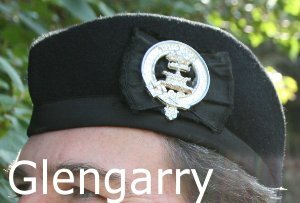 The Glengarry is the most common type of bonnet worn with the Kilt. It is black in color and has a place for a Cap Badge on the side and two long ribbons hanging from the back. 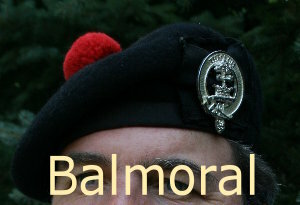 The second most common bonnet is the Balmoral which resembles the Tam or Beret. 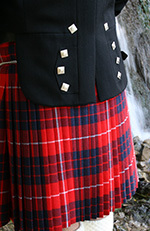 The Balmoral is most often black, but can be other colors as well. Both the Glengarry and Balmoral can also come with “dicing” which is the red and white check pattern sometimes seen. 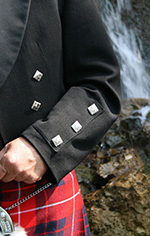 Both the Glengarry and the Balmoral top off a Kilt outfit quite nicely. For your choice of shirt, consider if you want to be Dress or Casual. If you want to go Dress, wear an the appropriate collared shirt and tie. For casual the polo seems to be popular. Some wear what is called the “Glencoe” or “Jacobite” style of shirt with the V neck and laces, giving a more “frontier” look. There are three basic styles of Jacket: the Argyll Daywear Jacket, Prince Charlie Jacket and the Tweed Jacket. Although all three styles can be considered Dress for our discussion, traditionally the Daywear is just that and the Prince Charlie for formal occasions. The differences between the Jackets is not just the material as in the Tweed Jacket. The Prince Charlie has stylish cuffs with three buttons, mini-tales behind and the lapels are satin. Therefore, the Prince Charlie Jacket has a more formal appearance. If you wish to look sharp without the cost of a jacket, just a simple plain colored vest or waistcoat is worn, or even a nice woolen sweater. If you just want to keep it simple, the best appearance is given with a nice collared shirt and solid color or matching Tartan tie.